BERKELEY—Members of Berkeley City College’s (BCC) Tobacco-Less Club have worked for the past year with city officials, council members, and the Downtown Berkeley Association (DBA) to reduce smoking in front of the college at 2050 Center St. and in the downtown, an area bordered by Berkeley Way on the north, Dwight Way on the south, Oxford St. on the east and Martin Luther King Way on the west. As a result of their efforts, new “Stop Smoking” signage, designed by BCC students and approved by Berkeley’s City Council and the DBA, will go up in the area at 12:30 p.m., Tue., June 19, with the first installation at Almare Gelato, 2170 Shattuck Ave. 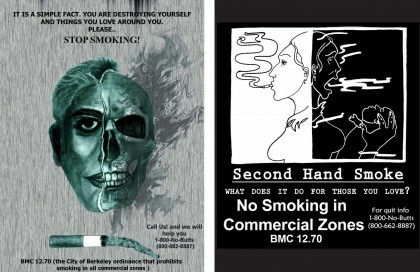 The city-supported artwork, displayed in downtown stores, contains information about BMC 12.70, the city’s no-smoking ordinance that prohibits smoking in all commercial zones. The BCC student group started their education campaign in 2011 when members started to distribute cards in front of the college, Language Studies International (LSI), a school for international students across the street, and Kaplan Testing on Shattuck Ave. The cards contained information about BMC 12.70. Even so, secondhand smoke continued to be a public health concern for the area, particularly at BART plaza, along Center Street, and in Civic Center Park. “Customers will actually walk out because of the smoke,” said Alberto Malvestio, a local merchant who owns Almare Gelato on Shattuck Ave. He noted that secondhand smoke, wafting through his windows from high school smokers in BART plaza, sometimes discourages mothers from purchasing ice cream because they want to protect their children. While Berkeley’s no-smoking ordinance has been on the books since 2008, many locals profess ignorance of its existence. 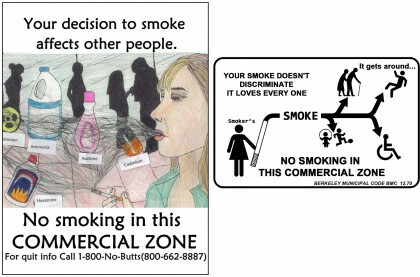 So, to further educate and enhance anti-smoking efforts in the area, BCC students sponsored an art contest in December 2011. Tobacco-Less Club leaders and the Community Health Education Institute, funded by a grant from the Alameda County Health Care Services Agency, met with the Berkeley City Council. The Council passed a resolution that directed the city to work with BCC students to develop and place no smoking signage in downtown commercial zones. Since then, BCC students have worked with the Berkeley Police Department to increase enforcement and ticketing for smoking downtown. BPD officers will be on hand for Tuesday’s community outreach event will also inform the public about the ordinance. Besides their collaborative relationships with DBA and the City of Berkeley, BCC’s Tobacco-Less Club members also work with the American Lung Association of California, and Berkeley’s Options Recovery Services, a drug and alcohol rehabilitation center. Dr. Davida Coady, Options’ executive director is passionate about creating smoke-free public space and was instrumental in creating BMC 12.70. I LOVE our BCC students. This is a fabulous contribution towards our public health. THANK YOU for writing this up and publicizing this important work. I went to see this. it was amazing. Thanks for posting. Awesome information. Great read. Thanks for sharing.